NASA held a press conference on Thursday to reveal some exciting new discoveries about ocean worlds within our solar system: It has found evidence that suggest a type of chemical energy that can support life exists on Enceladus, one of Saturn’s 62 confirmed moons. The new evidence comes from the Cassini spacecraft, which has been probing Saturn and its natural satellites since 2004 and beaming data back to Earthbound researchers. The discovery is not a surefire guarantee that there’s life on Enceladus, or anywhere else beyond Earth, but it is the “closest we’ve come, so far, to identifying a place with some of the ingredients needed for a habitable environment,” according to NASA’s Thomas Zurbuchen, as quoted in a press release. 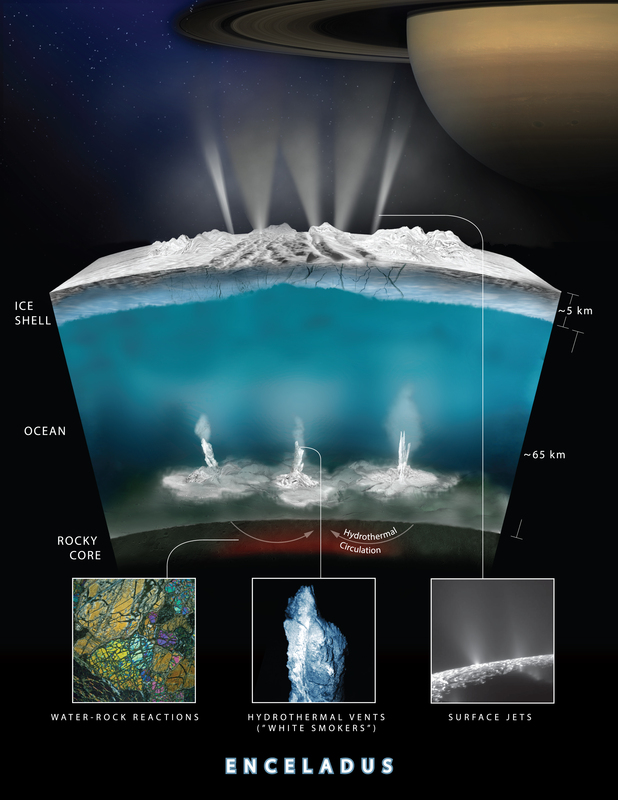 Specifically, hydrogen gas is thought to be coming from sub-sea vents and into the oceans of Enceladus, where it would provide the energy required their to support life forms including microbes. The process by which microbes break down hydrogen and produce methane as a resulting byproduct is thought to be fundamental to how life formed on Earth. Enceladus is small and ice-covered, as compared to Earth, but it has liquid water, and just about everything required for life. The only ingredients Cassini hasn’t yet confirmed are present are phosphorus and sulfur in the moon’s oceans, but that’s still something researchers studying the planet expect to find, given the apparent geological makeup of Enceladus. Cassini picked up hydrogen in a plume of gas and other material rising from the ocean that was observed on October 28, 2015. The Cassini craft actually descended into the plume and sampled its makeup, finding chemical mix that included 98 percent water and 1 percent hydrogen, as well as traces of other gases like CO2 and methane. The plume did not cough up any direct evidence of organic material – which would’ve lent much stronger evidence that it does indeed host life, obviously. But what they did find constitutes a veritable “candy store for microbes,” according to the lead author of the study detailing Cassini’s findings. NASA also found evidence that Europa, one of Jupiter’s moons, experienced a similar plume that also appears very possibly to have been liquid water emerging from its icy crust. The observation of the plume, which extends about 62 miles above Europa’s surface, was captured by the Hubble space telescope and is detailed in a new separate paper. The plan is to take a closer look at this plume using the Europa Clipper, an exploratory probe similar to Cassini planned for launch in the 2020s. Like every prior NASA announcement ever, this is not confirmation that there are organisms out there beyond Earth. But it could be the closest we’ve come yet, and it’s definitely reason to celebrate if you’re excited by the idea of extraterrestrial life.